Wow your dinner guests when you present this deliciously elegant and showy final course. Recipe by Chef Christopher Gross. Roll 6 pieces of parchment into tubes. Secure with tape. Set aside. In small double boiler over low heat, melt chocolate and butter. Stir. In medium bowl, beat cream and Mascarpone until stiff. Add cocoa. Fold melted chocolate into cheese mixture. Put mixture into pastry bag. Stand parchment tubes on plate. Pipe mousse into parchment tubes. Fill completely with mousse. Freeze several hours. Remove paper from frozen mousse. Drizzle 6 parchment strips with melted white chocolate. 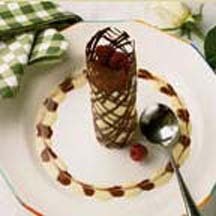 Wrap mousse with chocolate-drizzled parchment. Refrigerate. Allow chocolate to set on mousse 5 minutes. Peel paper from mousse. Chocolate will remain on mousse. Drizzle 6 parchment strips with melted dark chocolate. Wrap mousse and refrigerate until serving. To serve, remove parchment. Place mousse tower in center of plate. Dust edge of plate with cocoa. Garnish with fresh fruit and mint sprig.